From Time Immemorial Part II: the Non-Existence of "Palestinians." I reintroduced with my previous post the author of the book From Time Immemorial, Joan Peters, by presenting in the first installment of six her interview by Zola Levitt Ministries. Basically, the whole "Arab-Israeli Conflict" as I began to explain in my last post is solely an Arab conflict with Israel, which was not reciprocal: the Arabs hated the Jews, and didn't want them in the Middle East, which they considered 'their' region only. In order to legitimize their desire to 'push Israel into the sea' as they have stated many times (mainly in Arabic, to their Arab populations, not to the West), they fabricated a whole universe of LIES, from stating that the Jews have no history in the land and therefore no legitimacy being there, to the "fact" (a LIE) that there is a Arab Palestinian Nation. Thank you, Rabbi Y.Y. Jacobson. Rabbi Yosef Y. Jacobson of Chabad is a wonderful man and sought-after orator. I personally heard him speak when he came to my town a couple of years ago. I receive his weekly divrei Torah in my email inbox. I was very taken with his dvar Torah which he wrote after the murderous atrocity committed against Westerners and especially Jews in Mumbai two months ago. He called for us to do good deeds and kindnesses and learn Torah, to be sure--but he added something else, very important, which I whole-heartedly subscribe to and have said many times in this blog. It applies to the War in Gaza which Israel is waging defending against its enemies today. What Can We Do When Israel is at War? Gaza Updates roundup #12 and 12.5 are now UP at Jack's, here and here, respectively. What can we do, those of us who are not in the IDF? We can continue to do good deeds, mitzvot: help others, give tzedakah, study and learn Torah, do acts of kindness, and send an email to The Office of Rabbi Kook, Rehovot, at the following email address: maortlmo@gmail.com (hat tip: Shoshana). 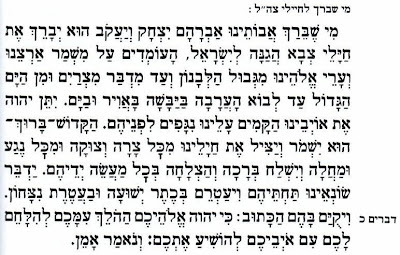 In the email you send, you can request the name of a chayal or chayelet (soldier) in whose z'chut (merit) you can do these good things mentioned above: giving tzedakah, helping someone, visiting the sick, learning Torah, reciting Tehillim (Psalms). I already did, and received my soldier's name: Tamar bat Chana. May we all merit to see Israel's quick victory over its enemies, and a JUST PEACE over Israel and the Middle East, AMEN.
. . . is up at Jack's, here. In the light of four katyushas falling in Nahariya in the northwest of Israel, one of which fell on a Beit Avot (old age home) with several injured, it is imperative that we keep abreast of the news. Read the updates. Rally for Israel. Do your part to spread the truth, and foster positive public opinion. And may GOOD triumph over evil. First and foremost, the latest War in Gaza Update is UP at Jack's, here. Saw this on a blog, can't remember which one (I'm bleary-eyed reading through blog after blog and article after article at the same time as listening to Radio Darom and watching emergency split-screen Israel TV while fasting) by Bret Stephens of the Wall Street Journal. The lead is very telling; Stephens wrote, "Maybe this column would get a better reception if it were titled, "No Endgame for Israel." Many pundits are commenting and arguing that Israel is lost, no matter what it does in Gaza. This author has, in my opinion, a good analysis of what Israel can accomplish with this war, but it has to not succumb to international pressure for a cease-fire and continue with its mission. I saw this on IsraellyCool and fell off my chair. Then I went to the article by Youssef M. Ibrahim* as published in Jewish World Review and saw that it was originally written in June of 2006. My heart sank; it's two and a half years, and they still haven't learned their lesson. What's it gonna take. . . I dread thinking about it. A Big Bronx Cheer to CNN...again.
. . . to CNN for it's brilliant, one-sided histrionic reporting-again- with their article entitled In Gaza, Living with Anger and Fear. "Listen, listen to this!" shouts Fida Qishta Re'ut as the crackling of rockets is heard over her phone receiver. "It's difficult for anybody to imagine that in a second, maybe when I am talking to you on the phone, maybe something [will] happen to me or to my family," the Palestinian blogger Israeli mother told CNN from her home in Gaza Sderot, [or Ashkelon, or Gedera, or the rest of Southern Israel]. In Case You Just Didn't Get It from my Last Post. . .
First of all, Haveil Havalim #199 (is it that many already?) is UP, at Ima's. Also check out Jack's Gaza Updates-9.5 and counting-linked here. Okay, so maybe I was too serious in my last post. You want funny? IMAO shows how Hamas can be funny (really). This is only an excerpt; go to the site for the rest of it. I really don't think the world knows what it's dealing with regarding the Arab mindset. The world does not understand their mentality. When you think about it, it really is an interesting, maybe even unique one. It perhaps is a Middle Eastern, Levantine, tribal way of conducting the business of life; I wouldn't trust most Arabs as far as I could throw them, and this is why: the Arab mindset allows for weaving a tale, for embellishing facts, for obfuscating the truth. Contrast that with Israel dropping leaflets over the civilian areas of Gaza, warning them to flee to avoid casualties, because their areas are terrorist strongholds and are being targeted by the IDF. The World Hates the Jews. I'm trying to rationalize this out, and that is the only conclusion I can arrive at. A psychologist would have a field day with this. Why else would the world rail against Israel for fighting back to protect its citizens? Why else would the world accuse Israel of using "disproportionate force?" Why else would the world cry out that Israel is ' indiscriminately killing civilians?' Why else are there 'demonstrations' against Israel's offensive in Gaza? I'll tell you what is disproportionate response. What is disproportionate is the world's reaction to tiny Israel making a belated attempt to defend itself and prevent further murder of its own civilian population.